The Detonics CombatMaster .45 is handsome with a nicely formed thumb safety that works well. The checkered rosewood grip panels are functional and attractive. To begin with, my review of the new Detonics 1911 is qualified by the fact that I have not routinely carried or used any of the very good compact 1911s for personal defense for many years. In fact, I have not done so since I last owned an original Detonics back in 1977. The coned barrel is relieved on its top to allow the barrel room enough for unlocking when firing. It's not that these guns are not good for the job; it's just that they require more attention for their upkeep than I care to devote to a gun. As I've written in the past, the micro 1911 must have fresh springs, recoil and magazine to ensure that the gun will cycle reliably. Simply put, when the 1911 platform is decreased in size, there's less margin for error, or, perhaps better put, they are unforgiving of neglect of these two areas. Knowing this, why do I now think I might well wind up owning the subject of this review, the Detonics USA pistol? I have two reasons. The first is simply nostalgia; I owned and carried an original Detonics off and on from 1976 through 1979. I bought and sold the gun twice to finance another "must-have" gun, like others have done. The second reason is the Detonics captive tri-coil spring system, which uses three rather than the more common two recoil springs on a full-length guide rod. The latter (two springs) should be changed every 800 to 1,000 rounds. They wear out quickly because they're doing the same work as a full-size single recoil spring but in a much shorter space. According to both Jerry Ahern, Detonics USA president, and Pete Dunn, the company's master gunsmith, the Detonics system is good for 5,000 rounds. Now, back in '76 I'd have swallowed this whole, since at that time there wasn't the body of experience now existing to indicate otherwise. Then, only a few talented pistolsmiths--Armand Swenson and Austin Behlert being the most notable--were miniaturizing 1911s on a very limited and expensive custom basis. Currently, a dual spring is used in other microcompact 1911s, with some owner's manuals recommending replacing the spring system, as I mentioned earlier, every 800 to 1,000 rounds. My own experience with them strongly supports this admonition. However, both Jerry and Pete pointed out that by using three rather than two springs, and there being slightly more room in the spring channel (by design) for the system, it allows for extended spring life. I do not doubt either's honesty, having known Jerry for more than two decades and he being an early Detonics fan. And Pete, well, he was the master gunsmith for the first Detonics company, so he should know his gun. Having said this, I think if I buy this one I'll also get two spare spring systems. I also want to do my best to get this gun in the hands of as many others as possible to get the round-count up. While the Detonics is not unpleasant to shoot, I'm not of a mind to try and shoot 5,000 rounds in a short period of time with it. The Detonics CombatMaster is 34 ounces of stainless steel with a six-round stainless steel Metalform-made magazine. The slide has a distinctive configuration, with the rear sight repositioned forward about an inch from the usual location. Behind the sight, the rounded slide has been flattened and slopes downward slightly a few degrees. A spurred hammer is used, and the spur is higher on the hammer body than is traditional. The reason for the slope and the raised hammer spur is to make thumb-cocking easier when carrying the gun with loaded chamber and hammer lowered. This works as intended and is as easy, if not more so, than doing this action with a full-size original design. This also makes lowering the hammer easier as well. past generations of 1911 users--military, law enforcement and civilians alike--who chose this mode of carry (as well as halfcock) with success. The heart of the Detonics system is this tri-coil captive recoil spring. All this being said, the Detonics has a nice, low-profile Colt lookalike thumb safety for cocked-and-locked carry. A coned barrel is used, and its enlarged portion locks into the front face of the slide. Historically, the codesigner of the original Detonics, Sy Woodcock, is responsible for the slide-and-hammer configuration. He carried his 1911 that way and wanted to improve the ease of raising the hammer. Disassembly is easy and does not require a tool, three hands or a large and coarse vocabulary. Simply clear the gun, pull the slide back until the disassembly notch is over the rear of the checkered slide stop, and push it out. Allow the slide to go forward and off the frame. The captive spring system is now not under any pressure and will, with slight forward movement, fall away from the slide. The barrel, with barrel link folded forward, slides out the front of the slide. Note the Detonics "slope"--the angled flat coupled with a raised, spurred hammer--done to facilitate thumb cocking. The ejection-port window is also nicely scalloped and relieved. This was originally done so as not to dent the empty case being ejected, but it does help in functioning, allowing more room for the empties to get out of the way. There is no grip safety. It has been replaced by a much shortened grip-tang insert, held in by both the thumb-safety crosspin and the full-size flat and grooved mainspring housing, which in turn is retained by the mainspring housing pin. The wood grip panels have large diamonds around the stainless steel and slotted grip-screws as well as checkering, and the Detonics logo is centered on each. The frontstrap is not checkered, and the 1911A1-type "short" trigger is grooved with an overtravel screw in its face. Trigger pull measured 5.5 pounds and was relatively smooth. Well worth noting is that the all-steel gun is made without using either plastic or MIM parts and is entirely made in the USA. The knife point indicates how the tri-coil spring system first to the barrel link. John Lysak and I spent the better part of two hours firing a mix of high- and low-end ammo through the gun, with mixed results. I had no function failures, but John repeatedly had a bullet nose down, stubbing on the feed ramp and failing to chamber. Jerry had already told me that the Detonics would not work with Remington Golden Saber, either the 185- or 230-grain bullet weights, but this sample did. The plain black rear sight is windage-adjustable and secured with a set screw. The slightly ramped front sight is dovetailed into the slide. I was skeptical, though, of the gun's ability to function with +P ammunition as my experience has been otherwise with subcompact 1911s. The slide simply cycles faster than the magazine can deliver the next cartridge for pickup. To find out, I fired three magazines of six rounds each (Detonics supplied two extras for the test and evaluation; only one comes with the gun) as fast as I could with Hornady 230-grain SXT +P, but all I got for my efforts was a sore hand from recoil. I did the same act using Cor-Bon 165-grain +P PowerBall and 230-grain +P JHP; again, sore hand but no malfunction. I discussed this with Jerry and Pete, and their advice was for an owner to try various loads and settle on one that they found to be reliable. As Jerry writes on the Detonics USA website and also mentioned to me, he has found that it is all too possible for one user to have problems with a particular gun, yet the same gun in someone else's hands will not malfunction. The cause is, he thinks, how each person grips the gun or, better put, how well he resists the gun's recoil. Shooting the CombatMaster for group was at first frustrating; I'd get two, three or four shots into a nice group at 25 yards, but one round would slide out, ruining an otherwise picture-perfect group. I had about given up after multiple attempts on the 5.5-inch Shoot-N-See bull's-eye targets when I realized that perhaps I was not seeing the sights well enough due to the combination of black sights, a short sight radius and a black target. I switched to a one-inch target paster and, using Remington UMC 230-grain JRN, was rewarded with a 1.5-inch five-shot group. Not wanting to push my luck, and with John agreeing, I stopped shooting for groups. Group-shooting at this distance might well be more effort than it's worth, but it is nice to know the mechanical limits of the gun. A 1.5-inch five-shot group at 15 yards with Remington UMC 230-grain ball--very nice. 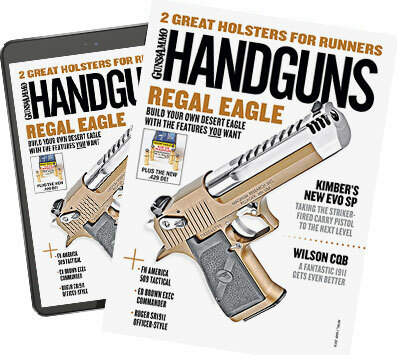 One note regarding the Detonics magazine: It is shorter by half an inch than the same six-round-capacity Colt mags due to an innovative idea. When the Detonics magazine is fully loaded, the rear leg of the follower protrudes through the baseplate via a slot cut in the plate. d, the magazine can be made shorter since it does not have to accommodate the follower leg. Arguably, the rear downward leg of the follower could be shortened, but this can create the problem of the follower body tipping forward during its cycle and causing a malfunction. The author, doing accuracy work off-hand. Although it wasn't expected, the short-barreled gun functioned fine with +P ammo. Finding a carry rig for the Detonics is not a problem despite the forward-located rear sight. I found it fit in an old Sparks Mirage belt slide, as well as ones from Gould and Goodrich. The Galco NSAII IWB also accepts it. Lou Alessi was the first to make a holster specific to the original and continues to do so. I also tried it in Galco and DeSantis elastic ankle rigs; it fits. Of course, it works in a good bellyband rig as well, and the gun is a natural for the various quality fanny packs. The Detonics website addresses its suggested retail price of $1,200 for the new Detonics as follows: "Not a bargain alternative to the traditional 1911-style semiautomatic, Detonics is the logical refinement." I can but add that you do pay for quality, and based on this sample, you get it.